The NFLPA, EarQ, and Boys Town National Research Hospital celebrate Todd Honas, a student who has excelled academically and athletically despite challenges surrounding his hearing loss. Andrew Hebert, Senior VP of EarQ, Todd Honas, the honoree, and Danny Noonan, former NFL player. 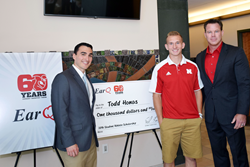 On July 22 in Omaha, Nebraska, Boys Town National Research Hospital hosted a ceremony for Todd Honas, a student athlete who received a scholarship from EarQ and the NFL Players Association's Professional Athletes Foundation (NFLPA). Todd overcame hearing loss to graduate from Aurora High School this past May. In addition to excelling academically, he played varsity football, basketball and track. Todd is the current record holder for four state football records, and plans to play football for the University of Nebraska Lincoln as a preferred walk on athlete. He has a thirst for knowledge and is motivated to tackle any problem that comes his way. EarQ and the NFLPA have been addressing hearing healthcare together for over five years, and the partnership is furthering its mission by granting scholarships to student athletes with hearing loss. The recipients are dedicated individuals who see success in both their chosen sport and in the classroom. With more resources to continue their education, these students are better equipped to thrive and become advocates and role models for young people with hearing loss. Through its partnership with the NFLPA and its not-for-profit organization, the HearStrong Foundation, EarQ can continue its mission to spread hearing health awareness and shatter stigmas surrounding hearing loss. Individuals like Todd help make this possible.